A combination of factors have made Gottingen Street on of the most feared neighborhoods in Halifax. Dalhousie architecture professor Grant Wanzel says the area has suffered from being a “dumping ground for public and social housing.” Cole Webber, a local resident, says “gentrification in Halifax’s historic north end is shaped by racism. It goes back to the razing of Africville and subsequent relocation of many of its residents to the Uniacke Square and Mulgrave Park housing projects,” he says. Wanzel is currently working to address the systemic issues in the area by implementing housing projects on Gottingen and surrounding areas. Wanzel is the president of the Creighton/Gerrish Development Association (CGDA), a non-profit developer that seeks to combine community initiatives with economic development. Wanzel believes that by providing affordable housing units to lower and middle-income individuals, the entire community will benefit. Wanzel says the Gottingen Street initiative can be used as a model for underdeveloped areas across the region and across the country. First, CGDA completed an 18-unit building at the corner of Buddy Daye and Gottingen Street that provides low-income housing for “hard to house” single people. The building was open in 2002 and is owned and operated by the Metro Non-Profit Housing Association. In 2004, CGDA completed 6 semi-detached units on Creighton Street, and in 2008 they finished a 12-unit building at the corner of Creighton and Buddy Daye. Wanzel says the overall intention of the project is to provide some affordable housing for low-income individuals, while at the same time, not losing any social housing. Wanzel believes these projects have already benefitted the area. “The three projects have already had a considerable impact on the neighborhood, just in terms of stabilizing it,” says Wanzel. CGDA’s fourth project is scheduled to begin construction in fall, 2010 and to be open by 2011. This final phase is a 48-unit condominium called Gottingen Terrace, which will be built facing the North Branch library. He says the condos will provide home ownership opportunities to people from the neighborhood. Webber, who is a founding member of the Nova Scotia Common Front for Housing says that most people in the north end who rent don’t see home or condo ownership as a viable financial option. 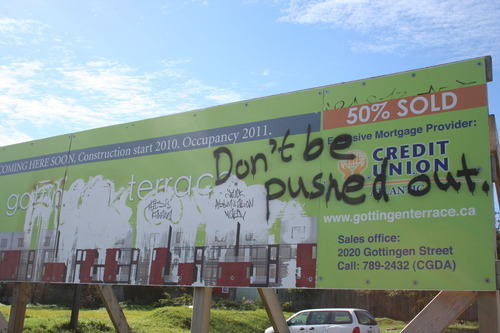 “When people who could never afford to own see condos going up on Gottingen, they see development that is not in their interest,” Webber says. “And they are rightly concerned that condos will raise property values, and therefore the cost of rent,” which could push them out of the neighbourhood altogether. Wanzel says home ownership opportunities will bring balance to a community that has a very high concentration of rental properties, of which 50 per cent are social and public housing. This final phase of the project may be the most difficult for Wanzel, due to a lack of financial assistance from the province. The lack of provincial funding means that Gottingen Terrace may not be targeted to low-incomes people. “If we were receiving deeper assistance from the province, it’d be possible for the households with somewhat lower incomes to access home ownership,” says Wanzel. Webber agrees that provincial funding is a problem. “Governments at all levels are withdrawing from their responsibility for social provision, including that of decent, affordable housing for poor and working people,” he says. Because Gottingen Terrace will consist of middle-income housing, the project has received negative feedback from some community members. Hazen Fry, who is a resident of Creighton Street, explains that the sign’s words refer to locals who are concerned about losing the low-income housing opportunities in their neighbourhood. Despite the criticism, Wanzel still believes the final phase of the project will be just as successful as the others implemented by CGDA.